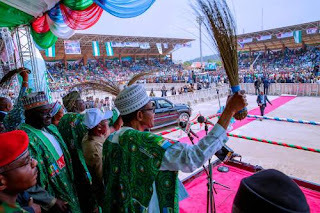 Few days to this year’s Presidential election, the Igbo Youth Assembly (IYA) has thrown its weight behind the re-election bid of President Muhammadu Buhari. The organisation at a press conference on Friday in Abuja told newsmen that it took the decision because they have found the President to be a man of impeccable integrity without blemish. The President General of the Assembly, Mazi Ifeanyi Nwaudunna, said the move was taken by the group after its leadership consultative meeting held in Umuahia, Abia State last Monday in the interest of political and economic development of the country. “IYA is the foremost nationalistic and most widely spread socio-cultural and political youth movement of the South East extraction, having leadership structures in every major village in Igbo land and in the Diaspora, working for and promoting the peace, unity, indivisibility and prosperity of the Federal Republic of Nigeria,” Nwausdunna said. He noted that the Igbo Assembly unanimously resolved to endorse President Muhammadu Buhari’s re-election for his resourcefulness, honest and transparent leadership style. He said, “What President Buhari has done in his first four years are unprecedented, there is not political party or individual today in Nigeria that can match him by all standards. We are happy about what is happening in our region, PMB has commissioned projects in the East, and we have seen what he has done in the past three years and half.